Have a question about Onagra? What is it, what does it do, how and when to use or something else? Ask us. 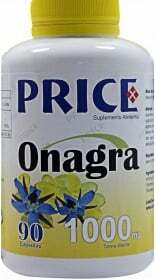 “Onagra 90 capsules Buy 2, Get 3” is currently out of stock. Enter your details below and we will let you know when it's back in stock. Take 1 capsule daily preferably before a meal. WARNINGS Onagra : Do not exceed recommended daily dosage! Food supplements should not be used as a substitute for a varied and balanced diet. Do not use if you are allergic to any ingredient in this product. Keep away from direct sunlight. Store at a temperature not exceeding 25°C in cool dry place away from sunlight. Keep away from children.